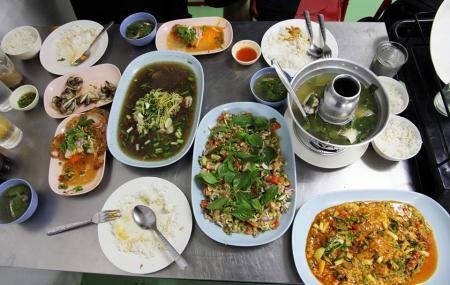 Use Bangkok trip planner to visit Soei Restaurant - Ã Â¸Â£Ã Â¹‰Ã Â¸Â²Ã Â¸™Ã Â¹€Ã Â¸ÂªÃ Â¹ˆÃ Â¸Â¢ and many others to your visit. How popular is Soei Restaurant? People normally club together Saranrom Park and Siam Relax Thai Massage while planning their visit to Soei Restaurant. Amazing Thai food, fresh and tasty and everything the reviews said it would be. We ordered the famous fried egg salad, was so delicious we ordered a second portion. The fried fish with crispy garlic was amazing, even for a person like me who doesn't usually eat fish for fear of bones. The eggplant with holy basil was another outstanding dish that we had to get s second order of. Overall, not a cheap place to eat but definitely worth of the price and trip to find it being so out if the way. Great Thai food with more spicy, herbal, pungent character than average. If this strong flavor profile is not what you like, look for other dinner options. Not the place to dictate your taste preferences (as if you are ordering some wrap in a mediocre american eatery), but to appreciate strong vision of the main chef. Never had to wait for a long time for food as other reviewers mentioned (maybe lucky on my 4-5 visits so far) and can't say anything bad about the service. Not cheap by local standards, but great value nevertheless. Food is good enough for me as a foreigner, however my Thai friend said the food is mediocre. The biggest let down is the attitude of the service: you can’t alter spiciness ( some dishes are extremely hot even for Thai let along foreigners); food can’t be canceled once ordered in even they haven’t prepared it (WHY? ); walls full of signs in Thai “reminding” you to order at once and no special requests given...etc; waiters/waitresses are either condescending or lack of enthusiasm, and they apparently think they are some hot-shot internet-made-famous hot spot in town that people have to dine there with nowhere else to turn to. Too bad! Won’t be visiting again based on the cocky attitudes and the unmanageable spice level: some dishes are just way too spicy even for my local Thai friend! All time favorite serving up fresh and satisfyingly spicy Thai food. Famous for marinated prawn with wasabi seafood dressing, deep fried gulf of Thailand sardines chin and much more.